Suite Sports: Are the Hawks Building an NBA Power in Atlanta? Are the Hawks Building an NBA Power in Atlanta? He may not get much love from All Star voters, but Atlanta's Paul Millsap has combined scoring, rebounding and elite defense to help push the Hawks to the top of the East. With their Spurs-like style under longtime San Antonio assistant Mike Budenholzer, the team has an Eastern Conference-best 28-8 record, their best 36-game start to a season ever. To put the Hawks’ performance into perspective, just 65 teams have performed this well through 36 contests over the last half-century. No wonder Budenholzer was recently named the December Eastern Conference Coach of the Month. As the only team in their conference with both offensive and defensive efficiencies in the top eight in the league, the Hawks own the NBA’s longest current winning streak and longest current road winning streak. They extended both of them on Friday when they went into Detroit and ended the Pistons’ seven-game winning streak with a 106-103 victory. With a franchise-best eight straight wins away from the Highlight Factory, Atlanta is in reach of the Warriors’ 10-game road winning streak, the best of the NBA in the 2014-15 season. The win on Friday also brought Atlanta’s overall winning streak to seven games, which is half of the team’s best streak all-time. The Hawks’ only 14-game winning streak in team history came in November and December of 1993. That Atlanta squad went on to become the first seed in the Eastern Conference playoffs for the first and only time in franchise history. In addition, it was the last time the Hawks won their division. If everything continues to go their way this season, the 2014-15 team will have home court throughout the upcoming Eastern Conference playoffs. I am not saying that the Hawks will be raising their second NBA Finals championship trophy in franchise history (the first was in 1958 when they were playing their games in St. Louis), but they look so strong thus far this season on both ends of the floor that they will be a force to be reckoned for more than just a few months in the regular season. Since barely anyone looks at their All-Star Game ballot and says, “Let me vote in some of those Hawks,” we will once again see no Atlanta players starting for the East in the 2015 exhibition contest on February 15. Paul Millsap and Al Horford, who have combined for three All-Star appearances in their NBA careers, would not start even if you quadrupled their combined votes in the third returns of the balloting. The fans are giving Millsap barely any credit for his top-10 ranking in ESPN’s real plus-minus. In addition, they have not given anywhere close to enough votes to the other two Hawks who are among the 40 best real plus-minus players: Kyle Korver and Jeff Teague. Thankfully, the coaches (or their assistants, or the team’s public relations people, or at least someone who has some idea of who the actual good NBA players are) vote on the All-Star reserves. Although the 3-point specialist has become increasingly important over the last decade in the NBA, I do not see Korver making his first All-Star Game. 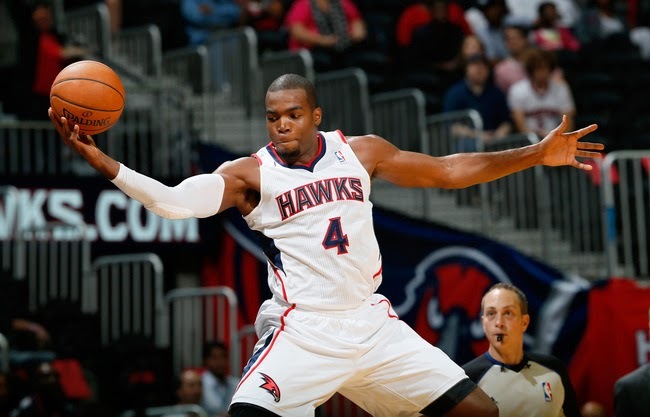 However, I envision Millsap barely beating out Horford for a spot and making back-to-back All-Star appearances. In addition, I am saying (and hoping) we see Jeff Teague make his All-Star debut in February. Only twice in the last 15 seasons have the Hawks had multiple All-Stars in the same game. The last time they had three All-Stars was 1980, and they have never had four, but anything is possible for the 2014-15 Hawks who are on pace for their best season ever.